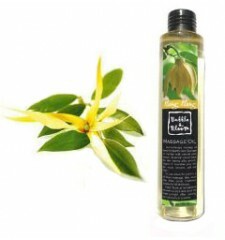 Ylang Ylang massage oil with properties like antidepressant, sedative and antiseptic 100% natural. The Ylang Ylang, also known as "perfume tree" because of its fragrant flowers, is a large evergreen tree. It is native to northern Australia, the Philippines, Burma and Malaysia. Ylang ylang means "flower of flowers". The essential oil is extracted from fresh flowers by steam distillation of water. The oil is used in soaps, cosmetics and perfumes (including high-end perfumes). The Ylang Ylang has many properties that are soothing, aphrodisiac, antidepressant, antiseptic, anti-infectious, anti-seborrheic, and hypotensive. It has a calming effect on the nervous system and is used to help treat tension, anxiety, frigidity and impotence. It is also used to treat insomnia, depression, hypertension, palpitations, and premenstrual syndrome. It is a great tropical tree about 20 feet high with large, fragrant, mauve or yellow flowers and is cultivated in Java, Sumatra, Reunion, Madagascar and the Comoros. The name means "flower of flowers". In Indonesia, the petals of Ylang Ylang flowers are scattered on the bed during the wedding night. The oil was a popular ingredient in hair preparations in Europe. The ylang-ylang has a euphoric effect, calming the nervous system and against anxiety, tension, shock, fear and panic while the aphrodisiac qualities are useful in impotence and frigidity. It can also help reduce blood pressure and is useful for intestinal infections. On the skin, ylang-ylang oil has a soothing effect. It balances sebum secretion, and has a stimulating effect on the scalp which promotes hair growth. This oil massage is extremely fragrant has a soothing effect on mind and body and is used in cases of frigidity and impotence. 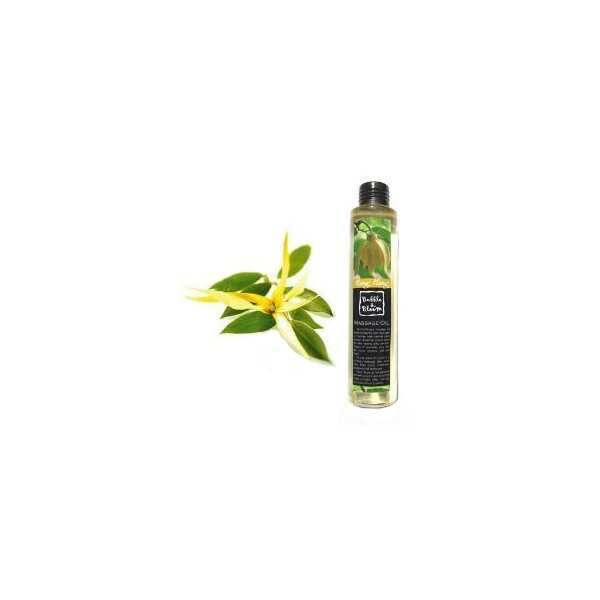 This massage oil has a soothing and stimulating the skin. It promotes hair growth by stimulating the scalp and balancing sebum secretion. The Ylang Ylang also has aphrodisiac qualities used to frigidity and impotence. It has a calming effect on the nervous system is useful when the subject has tension, anxiety, fear, shock or panic.